Fall is my favorite time of the year for many reasons: the changing colors of the leaves, the crisp and sunny Austin days, and of course, football is back! For me and everyone at Campus Advantage, fall also means move-in at our properties across the country. This is an exciting time for residents, their families, and even our staff, when new and returning residents begin embarking on the next step in their lives and education. As President and CEO, it makes me proud knowing residents are moving into a place that they can call home and where they are going to receive the best living experience possible. It’s also the most critical time in the resident calendar to ensure we’re setting ourselves up for renewals. As you’ll read in this newsletter, we reported a 14% increase in our “excellent customer service” rating over last year. This is a true testament to the hard work and effort our on-site teams put into making sure the needs of our residents are put first and working hard to ensure they immediately feel the sense of community that sets Campus Advantage apart from other student housing providers. Fall also represents the most active acquisition time of the year for the student housing industry. Over the years, we’ve helped both new and experienced investors through their acquisition process, and through consulting services such as market analysis and due diligence. Having delivered more than 250 consulting engagements to date — in addition to owning and managing our own properties — we eat, sleep, and breath student housing, and bring that experience to every consulting project and property. At Campus Advantage, we have many more acquisitions on the horizon, and we look forward to sharing those with you soon. Speaking of resident experience, we recently held our 14th annual Experience Conference in Colorado — a five-day workshop for 85 team members, in a variety of roles, aimed at collaboratively finding ways to continue improving property performance, as well as continuing to make the resident experience the very best for every Campus Advantage community. It’s a week filled with inspiration and an opportunity for our employees to meet team members from across the nation and learn from one another. I look forward to watching their new and creative ideas come to life! I, as well as the Campus Advantage leadership team, wish you a very productive fall and remainder of 2018. Move-in and the following six weeks make a tremendous impact on a resident’s decision to renew in the coming year. During this time, our residents are settling into their universities and their peer relationships. If their living experience is challenging, this can negatively impact their year, as well as their eventual decision to renew. That’s why we put a significant emphasis on delivering excellent customer service, along with fun, memorable events that help to connect our residents with our properties and to each other. From August through October, we’ve hosted 935 events across 62 properties — including barbecues, picnics, craft nights, and more — culminating in Resident Appreciation Week. And our focus on elevating the resident experience shows. In our resident move-in survey, which closed in mid-September, we earned a 14% increase in “excellent customer service” ratings over last year, with more than 300 staff members called out individually by name for delivering great service. In September, we hosted our 14th annual Experience Conference, an intensive staff workshop focused on improving property performance and equipping leaders to drive success at their communities. The 85 attendees — roles ranging from RDs to GMs representing each of our managed properties — dove into topics such as customer service, leadership, facilities management, and financial management, all with the purpose of creating action plans that will continue to evolve the resident experience for every Campus Advantage community. 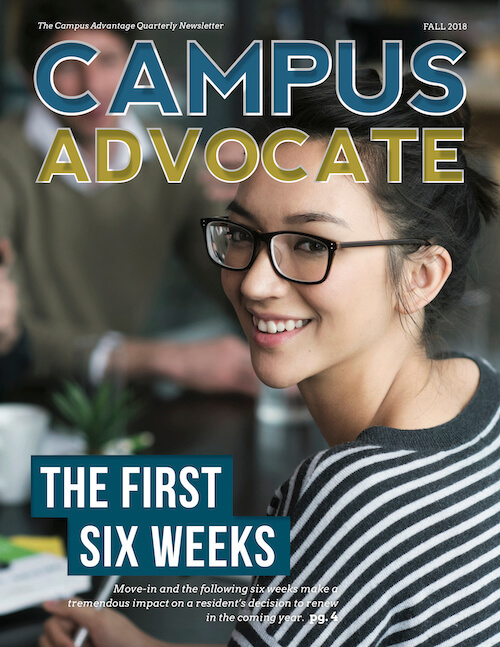 Campus Advantage has begun fundraising for a new programmatic joint venture to invest in student housing assets. The venture will be geographically diverse and pursue multiple strategies, leveraging the company’s fully integrated platform and deep industry knowledge to deliver a strategic exposure to the student housing asset class. Through programmatic joint ventures and best-in-class management services, Campus Advantage has built its portfolio of owned and managed properties to more than 34,000 beds, continuing a decade-long record of being ranked within the top 10 student housing managers and owners. As part of our Students First® Experience, we are always looking at ways to enhance students’ success. One of those ways is through RentTrack, a new program we are offering in which our residents can build credit with their on-time rent payment. Residents who choose to participate will also receive credit education, credit monitoring, and score alerts. We are very excited about this new offering as it protects students’ credit and provides an opportunity to build their credit history quickly as only positive data is reported. For more information, visit renttrack.com/campus-advantage or contact our Students First® team at [email protected]. Have you seen an impact on turnover at the property level over the past several months? What are you doing as a company to keep your property-level personnel onboard, engaged and committed? As a property accountant for Campus Advantage, Kayla Coluci balances staying on task and on deadline with her personal principle of having fun and achieving work / life balance — a balance that includes keeping investors and residents happy, while also being a part of a local basketball league. Priscilla Hall is serious about finances. As Campus Advantage’s Accounts Payable Supervisor, she oversees the entire Accounts Payable (AP) department, leveraging her leadership to develop a strong, confident team while ensuring that residents at various Campus Advantage properties have the utilities they need for the best possible academic and personal experiences.